Your contribution helps bring a child home and funds critical outreach and prevention programming. Join the Heroes’ Circle with a monthly or quarterly gift. Your ongoing support will help recover missing children, combat child sexual exploitation, and give hope to families across the country. Join today! A donor advised fund (DAF) is a charitable giving program that allows you to combine the most favorable tax benefits with the flexibility to support your favorite causes. Check if your organization is participating! Look great and support your favorite charity! 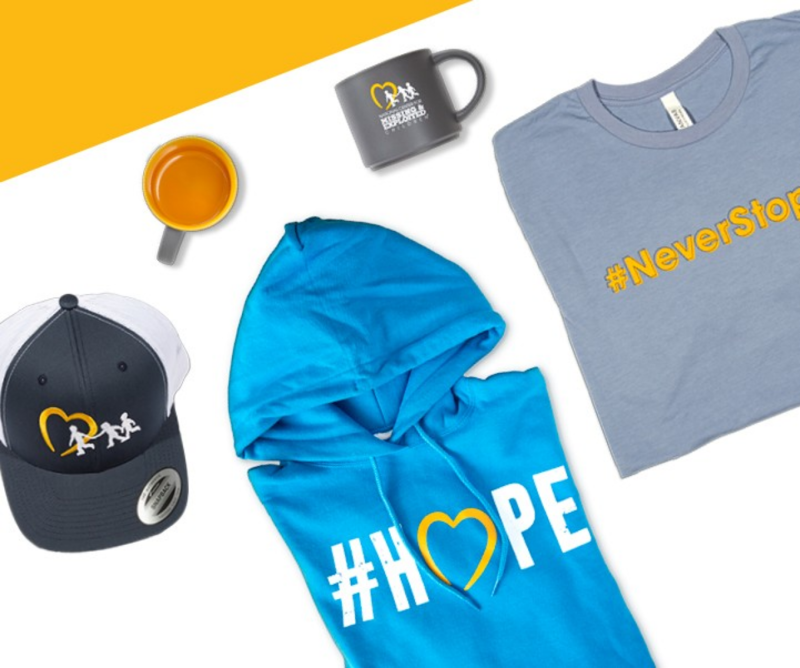 Wear the #HOPE heart and other NCMEC gear to show that you stand in solidarity with victims and their families. Support NCMEC with each purchase on Amazon! Amazon donates 0.5% of the price of your eligible Amazon Smile purchase to charity. Simply select NCMEC as the organization you want to support and start shopping on Amazon Smile. Federal employees can support NCMEC by taking advantage of the tax-deductible donations made through the Combined Federal Campaign philanthropy program that their workplace may offer. NCMEC’s CFC number is 11822. Make a powerful impact with gifts of appreciated stocks, bonds, or mutual funds. Contact vwodarcyk@ncmec.org for more information. Learn about what types of planned gifts can help you leave a lasting legacy. Let your company increase your impact with a matching gift. Use the form to see if your company will match charitable gifts. Follow the directions to submit your receipt and matching request to your company, and watch your impact multiply! Create a culture of caring within your company by setting up payroll deductions and let employees directly support NCMEC. A staff member can help set up an employee giving program that works for your company. Contact NCMEC's Development Department at 1-866-411-KIDS (5437) or development@ncmec.org to find out how your company can financially support NCMEC's efforts to find missing children and prevent the sexual exploitation of children. Donate now to have your name or company featured on our HOPE wall. From galas to bake sales, and everything in between, anyone can become a fundraiser for NCMEC! Check out local events in your area, or host your own fundraiser! Help spread the word about missing and exploited children’s issues by following us on social media @Missingkids, or becoming a poster-sharing partner! NCMEC works with corporations and foundations to create customized programs that help raise crucial funds to help recover and protect more children. Learn about how your group can make a difference. The National Center for Missing & Exploited Children® will not sell, trade or share a donor’s personal information with anyone else or send donor mailings on behalf of other organizations. At any point donors may contact NCMEC’s Development Department to remove their names and contact information from mailings.